Every time IT administrators hear about upcoming compliance checks, they want to bury their heads in the sand like an ostrich. Why? Because every audit check means long hours, manually pulling together dozens of reports to satisfy auditors and continuous fear that something important might be neglected. To survive audits with far less time and effort, you need effective SharePoint compliance management built into the larger enterprise. With the right solution at your fingertips, you can simplify compliance preparation and reporting processes, while ensuring you can provide all the evidence auditors require to prove that your Microsoft SharePoint content is secure. Authentication. Authentication helps secure your critical assets and ensure accountability of users across your organization. Restriction of access to SharePoint assets. Most regulations and industry standards require you to manage records access. Limiting access to SharePoint assets, and regularly reviewing access permissions, as part of your data loss prevention (DLP) strategy helps ensure that only individuals with a legitimate business need can access highly sensitive data. Logging access to SharePoint resources. Logging all read, write and update access events to highly sensitive information helps establish accountability and ensures that you have audit data readily available for in-house security investigations and compliance checks. Retaining data. You need to make sure that you keep your data for as long as applicable regulations require, and do so securely to minimize the risk of data exfiltration. How sure are you that your SharePoint is compliant? How easily can you provide proof to auditors that your critical assets are shielded? 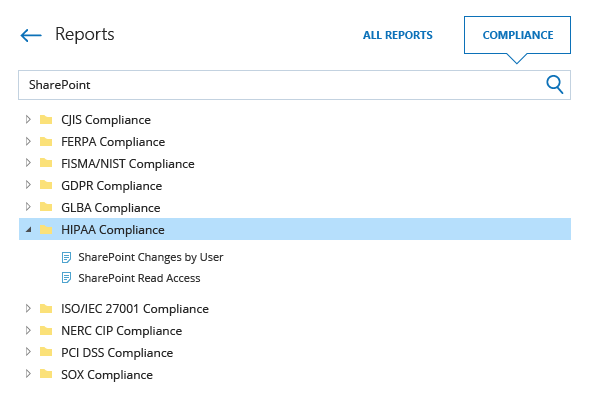 For on-premises SharePoint, you can use the built-in reporting capabilities in Site Collection Administration; if you have SharePoint Online, you can use Office 365 Compliance Center. But in either case, you will have to manually create a report every time you’ll need one, and then export the audit data into Excel or another format for a closer review. This approach is error-prone and tedious because you’ll have to sift through mountains of audit logs in order to spot suspicious activity, and generating reports will eat up much of your time. Is there a way to stop burning yourself out every time you have to perform eDiscovery or prepare for compliance reviews by getting efficient compliance features to simplify your life? Gain 360-degree visibility into all activity across your SharePoint resources to better secure your sensitive assets. Make reporting far simpler than ever before with predefined compliance reports mapped to the most common standards, including FISMA/NIST, GDPR, HIPAA, PCI DSS and more. Streamline reporting processes by subscribing yourself or security officers to the reports each of you needs and have them ready to pull out during your next compliance check. Find answers to auditors’ requests much faster with the Google-like Interactive Search. Respond to emerging threats by staying tuned to critical activity across your SharePoint environment with custom alerts. Securely store your SharePoint audit trails for years in the cost-effective two-tiered (SQL database + file-based) storage, and access them whenever your next audit check approaches. Gain a single-pane-of-glass view into what’s happening in your SharePoint Online by using Netwrix Auditor for Office 365.